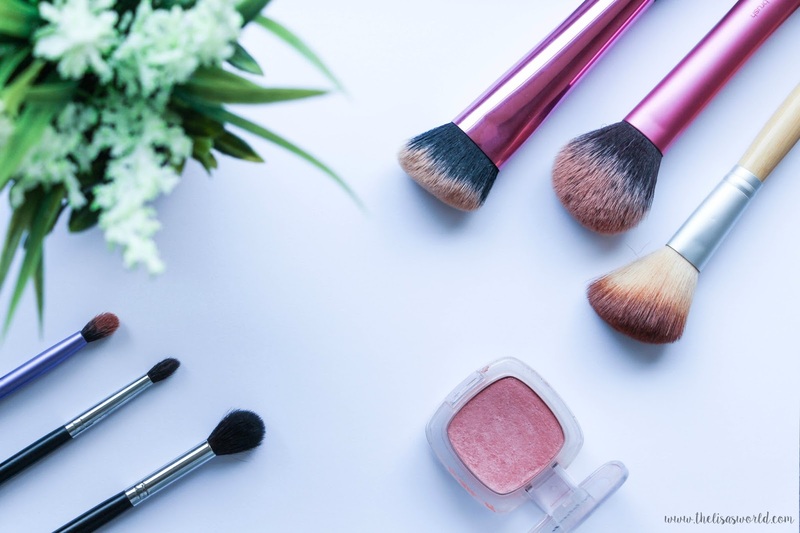 I put together six makeup brushes that are essential to me on an everyday basis – three face and other three eye makeup brushes. All my brushes are drugstore and therefore, the six chosen ones are of course drugstore brushes! Great for someone who likes to save some pennies and still have great brushes that stick by your side no matter what. Starting with face makeup brushes, I have to admit that this was quite an easy decision. These are the three brushes I use every single time I apply makeup, honestly. 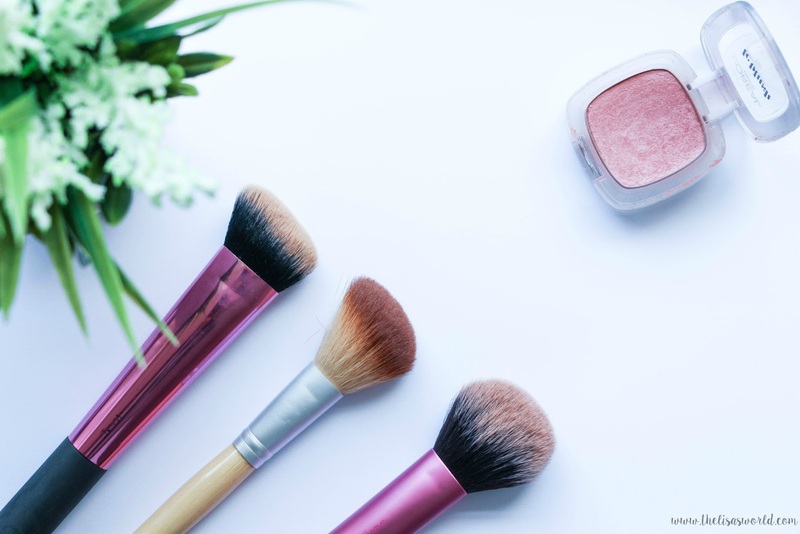 For foundation I would normally go for the beauty blender but if I am in a rush and want a flawless finish with good coverage, I instinctively pick the Real Techniques Sculpting Brush. Created to either contour or apply blush, I use it for something completely different: to apply foundation. And let me tell you that it is an amazing brush to do so! I never thought of using it for foundation but once I saw Tanya Burr using it and saying that it is really good to apply liquid foundation, I went ahead and since then it has been the chosen one. It my baby! The bristles are short and dense, packing a lot of the product and evenly distributing it on your skin. It is not the biggest face brush but its shape and bristles help buffing the foundation quite easily and effortlessly. It gives you a flawless finish, no lines or anything of that sort that some other brushes do. Some people really like big brushes to powder their faces. I am not like that at all. I like smaller brushes so I can powder my under eye and around my nose quite easily. The brush that I use is the second one on the photo that unfortunately does not have a name. It was one of the first brushes I bought and I got it from Claires. So I have no idea of the name but it is just the fluffiest angled brush ever. Perfect for the under eye area as you don’t want a brush that is to harsh and might irritate your skin. This is perfect for me and I use it all the time. Because it is very fluffy and not dense at all, it is great to apply powder products as it will never apply too much. It will simply distribute evenly the product on your skin. I love it! On an everyday basis, I don’t do a very sharp and defined contour. I normally go for a very natural look and apply either some bronzer or a contour shade just to add some definition back to my face after applying my foundation. To do so, I always use my Real Techniques Multitask Brush. It is big and fluffy so it is perfect to just add some shades and definition back into your face. Also, I use it for blush too. After all, it is a multitask brush, correct? Moving on to my eye shadow brushes, let me tell you that just like the other ones, these were quite easy to choose too. I normally go for a natural look when I do my work makeup (you can see it here), therefore I never need a lot of eye brushes. But when I do a bit more. These three are the ones that will make my smokey eye look flawless. It was when I discovered Beauty Bay that I fell in love with Morphe Brushes. When people like Jaclyn Hill, Desi Perkins or LustreLux rave about these brushes, I have to try it! So I bought my first two Morphe Brushes on Beauty Bay and since then, eye shadow application went to a completely different level. 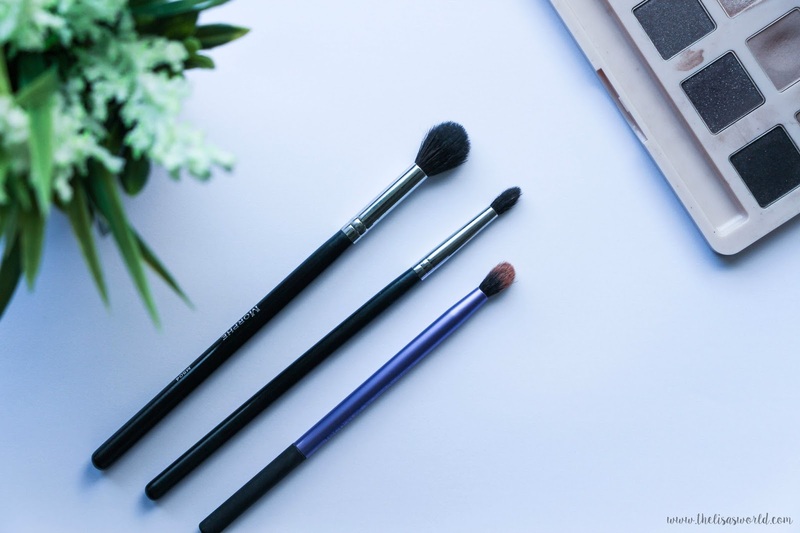 First, lets talk about Morphe M504 – the smoothest, fluffier blending brush I have ever tried. Yes, it is quite big but to apply that transition shade on your crease or even blend out everything at the end, it is the best one. The Morphe M507 is another one of my babies. Pointy and tapered, it is the perfect shape to define your crease and the outer corner of your eye – I love it. It is, again, very smooth. I use it every day, for the simplest eye makeup looks or the darkest and smokier look. Absolutely fantastic. Going back to Real Techniques – you can tell that I really love this brand don’t you? – I could not forget my Essential Crease Brush. This brush and the M504 work together so well! While the M504 is larger and less precised, the Essential Crease Brush by Real Techniques has the perfect size to define your eye socket. It is quite pointy and that way it fits your crease really well and it is also smooth and easy to blend all the eye shadows. It is a great brush too! And there you go, my Top 6 Makeup Brushes. What are your favorite brushes at the moment?